It’s been a couple of months since I’ve been able to do much baseball writing, but at least events have transpired to allow me to get back on track at a great time in the season. With the best part of two months still to play in the regular season, the National League in particular still have many twists and turns to come. And whilst the American League may already have four teams looking very likely to claim a play-off spot, the second Wild Card could be a source of plenty of excitement for this A’s fan. The Astros-Giants pitching match-up on Tuesday looks a belter, and that’s available to watch both via an MLB.TV subscription and BT Sport. Chris Archer’s second start with the Buccos comes on Wednesday in a road game at Coors Field against the Rockies. The Braves-Nationals game is listed as a second Facebook Game of the Week on the current MLB.com listings, although it is also being broadcast on TV in the UK so that those without a Facebook account aren’t blocked from viewing it completely. A Corey Kluber start is always an event worth watching, so that’s a good reason to catch at least some of Cleveland’s game against the Twins on Thursday. All times are in BST. 19:20 Nationals at Cubs (TBD, Hendricks (8-9)) *BT Sport/ESPN. All of these games are available to watch or listen to live via an MLB.TV subscription, other than the Facebook live game which is exclusive (but free) to Facebook subscribers. 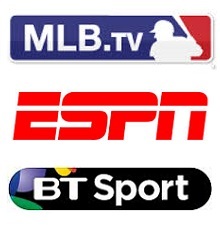 TV coverage of MLB in the UK comes courtesy of the BT Sport channels and these are highlighted above, as are any games that are available to view online for free via MLB.com. The above list of games just shows those starting before midnight UK time. The full schedule of MLB games can be found on MLB.com.